A friend of mine, Slobodan Drakulic, died unexpectedly a few days ago. I hadn’t seen him for almost 18 months, but I missed his company if not on a daily basis, then frequently enough that I was often dimly aware of a resented absence in my life, a hole that could only be filled by Slobodan. He wasn’t, you see, a man you merely liked or enjoyed. You loved this man, because of his brilliance, his vitality, his generosity and his eccentricity. 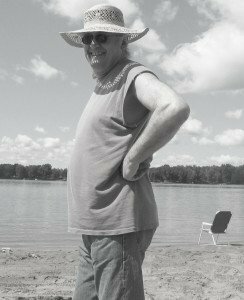 In the fifteen or so years I knew him, I never once saw him when he wasn’t at full velocity, even when he was relaxing on the banks the Ottawa River near Fort Coulonge, Quebec, where he and his wife Patrizia Albanese owned a recreational property. We first met at a book launch, and instantly liked each other. A month or so later he called me up to help a Bosnian-Muslim poet named Admiral Mahic, who’d been brought in as a writer-in-residence at Massey College, and had turned out to be not quite the Koran-reading mystic expected. Slobodan’s plan was to translate Mahic poetry, which no one at Massey or PEN had seemed interested in getting done, and he’d figured out exactly how to do it: find a Canadian writer with a sense of justice and some intellectual flexibility (me), sit me down with Mahic and a couple of people (himself included) who spoke both Serbo-Croatian and English, and wing it. It was simple and brilliant, and it worked. For nearly four months, we met at Dooney’s Café on Bloor Street for the afternoon twice a week. Mahic turned out to be a true poet, once we got him sobered up. He may not have known where he was, or how to deal with the finicky North American students around him, but he always knew where he got his images from, and we got decent translations of his poems. We also jammed on Homer and the Epic of Gilgamesh, the history of Yugoslavia, its writers, the reasons for the country’s disintegration, and anything else that came up. Our sessions were the most literate and intellectually stimulating encounters I’d had since I moved to Toronto—or since—and by the end of it Slobodan and I were close friends and collaborators. Slobodan was an anarchist, the only true one I’ve ever known. He was a political anarchist, but it went far beyond that. His father had been a Titoist general charged with hunting down and executing the remnants of the Croatian Ustazi and the Serb nationalist Chetniks after World War II, and Slobodan thus grew up inside the communist apparatus of Tito’s Yugoslavia. The experience gave him both a detailed understanding of and an encompassing loathing for Marxist-Leninist Bolshevism, and a lifelong dislike for any kind of authority, no matter where he encountered it. He was temperamentally dissident to everything except non-devotional understanding. He was also temperamentally courteous and sanguine, the most gentle and casually cheerful man I’ve ever met. He liked people, the more idiosyncratic the better, and he didn’t care where they’d come from. The parties he and his third wife Patrizia Albanese held more or less annually at their Toronto house were typical. There was always enough food to serve 300 people, a mix of Balkan and Italian delicacies broad enough to get anyone, whatever culinary pickinesses they harboured, to overeat. The parties were always crowded, with sociologists (Slobodan taught sociology at Ryerson University the last seven or eight years of his life, as did Patrizia, a sociologist of equal brilliance), scotch-drinking historians, Serbo-Croatian Opera singers, writers, teenagers, small children, bewildered neighbours, elderly but urbane parents. Yet when you arrived, Slobodan would always present you with something specific, (for me it was usually a couple of bottles of the wines he’d discovered I liked), and the way he’d wrap his big arms around you made it clear he was glad you’d come. He did the same for everyone, effortlessly and graciously, and it made everyone glad to be his guest. First, he is a man without violence, because he understands that enforcement of any idea is alway violent. Second, and rarer, he is without dourness. He is a walking proof that intellectual merriness is NOT a contradiction in terms. Third, he is also a man without a jot of righteousness anywhere in his being. He does not think that his portion of the human condition is morally superior to any other, and he does not look down on others—unless of course you happen to be standing next to him, at which point he can’t help it. Finally, Slobodan is genuinely interested in everything. Not only does he know where Lenin’s heart is partitioned and pickled and what happened when Gilgamesh went to the underworld to rescue his friend, he can tell you where to buy bottled water from Poland, where to get better spinach pies, and where to buy Chinese furniture on the cheap. True civility requires the precise qualities Slobodan Drakulic embodies on a day-to-day basis: kindness to those who are smaller (which virtually everyone is); curiosity; merriness; an interest in human knowledge for its own sake; an understanding that education is the most crucial occupation of a democracy; generous wisdom; industriousness and a relentless demand for justice. All of those things remained true of him to the end of his life. He was a big man in every sense of the word “big.” The biggest part of him, I think, was his heart, and I simply can’t bring myself to change the things I wrote about him when he got married to the past tense. That’s because what I’ll retain of him will remain in my present for a very long time.